Now that the year is coming to a close, we finally get to say “I took that class,” “I did a semester of_____” (fill in blank). But I couldn’t help but notice that this time of year also brings out “I wish I would have” conversation points. It got me thinking about what we could do that would make us feel good about our accomplishments. We tend to think inside the box when it comes to our workout routines, which is a fault in our fitness productivity. 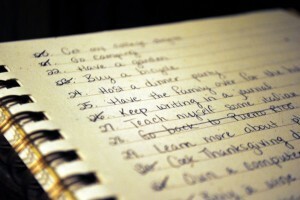 Therefore, as the year comes to a close, I thought a bit about things that we can accomplish before the year ends. Whether you are graduating or going home for the summer, it’s never too late to accomplish something big. Here’s how you can do just that. Group Fitness Class Double Whammy: This does not apply to attending Core Complete class beforehand, but rather a full class followed by another. This can be back to back or it could be spread out throughout the day. I would recommend that you choose wisely as to how you pair the two, preferably stay away from two cardio classes in a row. Morning Group Fitness Class: Hopefully you’ve already gotten the chance to try out one of the morning classes here. If you have, you most likely know firsthand that they set you up for a great day. Not only does it wake you up and make you feel great the whole day, but you also exceed your expectations as to what you can accomplish before 8am. The thought of this might terrify you, but the key to getting yourself there is to let your groggy brain not think about what you are doing or where you are going. Just do it! Take an Aimless Walk: A lot of students tend to stick to only the building that they need to be in for class, and don’t take the initiative to venture off and explore the entire campus. If you have some spare time during the day, just go for a walk. You may be surprised at what a great stress reliever it is to just walk around with no destination. You can also explore and become more familiar with campus. Get a Massage: I don’t know about many of you but I was surprised to hear that you can get a massage here on campus. Getting a therapeutic massage is a great way to promote healthy body functioning and relive stress and provide general relaxation. With finals around the corner, I think it’s safe to say that you’re going to need one, so give it a try. Go Ask Alice: While looking through the UHCS website, I stumbled upon an interesting and convenient resource called Go Ask Alice. Through this website you can ask any of your health related questions, from advice on nutrition to emotional health, you can have the answer a click away! Of course this is something you do online therefore you don’t need to complete it before the year ends, however it is a useful tool to have on hand especially when you are too busy to see a doctor for a simple question. Swim: Maybe I’m a little biased because I already love to swim, however some people have yet to take advantage of their access to the pool that comes with their gym membership. Even if you don’t know how to swim properly, take a step out of your comfort zone and give it a try. It is a great workout and a fun one at that. Write up a work out on a sheet of paper and stick it on a wet kick board to keep on the end of your lane so you can follow a solid workout. We are given so many helpful resources to maintain and enhance our health in many aspects. There is so much more we can do with our days here on campus, and doing what hasn’t been done, exceeding expectations, and overachieving, start with creativity. So think outside of the box and change up your routine in ways that will allow you to experience a healthy life on campus in a new way. ~ Dermatologist Dr. Ijaz from the University Hospital in Karachi found that “all makeup comprises of artificial substances and a large number of chemicals which can harm the skin. These chemicals can seep into your bloodstream via skin absorption”. 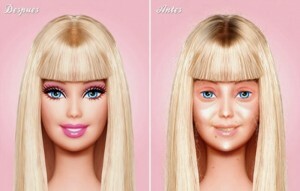 ~ Make-up is the root cause of acne and skin problems for over 30% of females. ~ Eye shadows are known to contain lead, a carcinogen and neurotoxin that can affect the nervous system adversely, leading to high blood-pressure, allergies, behavioral abnormalities and even decreased rates of fertility! ~ It has been found to be a cause of headaches in women due to the amount of weight it can put on the face causing the head to ache. 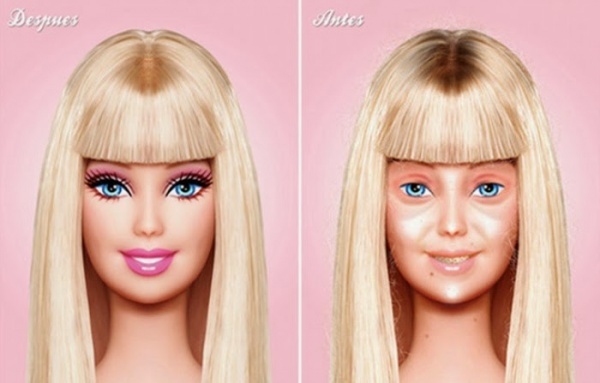 Avoid wearing make-up for long periods of time to avoid this! ~ Wrinkles and other signs of aging quicken the earlier and more often you apply cosmetics to your face. ~ Lipstick contains aluminum, which may cause long term anemia and even glucose intolerance. ~ Mascara can cause blindness as it contains pseudomonas aeruginosa, which is a very harmful therapy bacteria. Something important to know is that when a cosmetic product states “Herbal” or “Natural,” there is a good chance it might not be. Cosmetics do not have to be legally tested before placing these labels on the products. If you must wear make-up, making sure you know what products are better for your skin is important. A few ingredients to steer towards are Argon oil-based, plant-based, and fragrance free. Check this out to read about even more 25 Safer Alternatives. There really is nothing better than being able to rub your eyes in class when you are getting groggy. Am I saying I will never wear make-up? No, but I won’t wear it unless it is a special occasion. If we all stop trying to look like something we are not, men will have to start loving the natural beauties that we actually are. One of my favorite quotes is “Be your own kind of beautiful” and I truly think you should. Don’t cake on the powder, thicken the liner, or plump up them lips without thinking twice. There is no better version of you than the natural one. Sources: Harmful Effects of Cosmetics, The Cost of Beauty, Cosmetics, 25 Safer Alternatives. 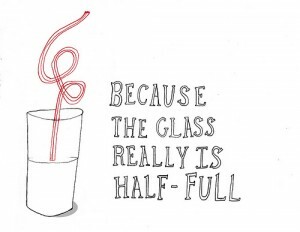 Okay you know the drill: there is a light at the end of the tunnel, positivity is power, the grass is greener, the glass is half full and all that jazz. I’m not here to be a motivational cassette tape in the form of a blog, because you’ve heard all of the clichés. Instead, I want to talk about the inevitable result of a positive mindset, and why we often subconsciously choose negativity. Not only did the concept of giving up negativity arrive via imessage at a perfect time, but it’s so wonderfully simple. Of course it’s easier said than done, but I’ve learned that the first step to minimizing negativity is to take the initiative to verbalize it. This was made clear to me when I wrapped up my appointment at UHCS for an untimely cold by being asked to participate in a small lifestyle questionnaire by the UHCS’s Health Educator. I learned a couple things about what simply verbalizing positive words can do. Changing “I have to” to “I am going to” will make you more prone to fulfill a task, whether it be going to the gym, doing homework, cleaning, etc. Eliminate your negative self-fulfilled prophesies. Above I mentioned using “I am going to” obviously doesn’t apply to negative outcomes. Saying “I am going to fail this exam” gives you a mindset that the fate of your exam is a lost cause and putting any extra effort in is useless. “I’m not naïve and not negative” I’ve come to the realization that people choose to verbalize their stress in order to portray the hard work they are putting in. The truth is, people who are positive are not floating through life. Rather, they are choosing the healthier route, which allows them to accomplish more. Everyone has stress in some shape or form, so don’t predict or compare other people’s work load based on how much they complain. That is just silly. Stop that. “Don’t be a Negative Nancy” You may have heard this phrase before. It may have been directed at you, or maybe you’ve even used it yourself. The thing about being a negative Nancy or a pessimistic Patty is that you’re not purposely trying to be the Eeyore amongst all of the Winnie the Poohs. Like I mentioned above, complaining is a natural way for us to make our hard work recognized. However, although venting is completely healthy, comparing your work load to other people’s work load is a parasitic relationship. You’re killing their vibe, man. Simply setting yourself up for success through words and expressing what you can and will accomplish is an initiative that we naturally pass up. As the end of the semester is right around the corner and final exams are quicly approaching, I encourage you to use the infamous exam week as an experiment. Pitch positive self-fulfilling prophecies to your friends while cramming for an exam, put it on social media, and overall carry that healthy mindset with you and examine the outcome. Lastly, it is important to not only surround ourselves with positive people, but also to be that positive person. 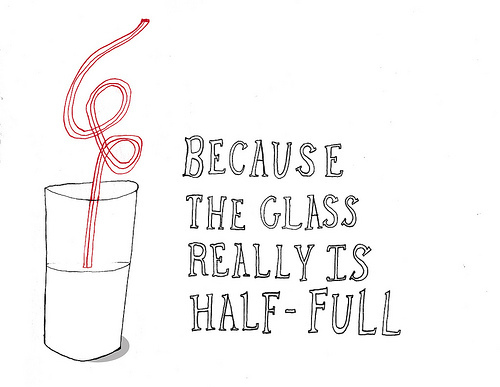 So keep your chin up and head high, because the glass can be half full if you want it to be.